I've tried several times to install the trial what seems to successfully install but every time I start the program I get the error message "Unable to initialise the network driver. Please reboot the system or reinstall this application.". What version of Windows and the Connection Emulator are you using? sorry getting back so late but I didn't get a notification. I'm using Windows 7 SP1 64 Bit with the latest Connection Emulator version 1.5. I've tried the program already some months ago and had the same problem. "Unable to initialise the network driver. Please reboot the system or reinstall this application"
Same situation like Phillip. 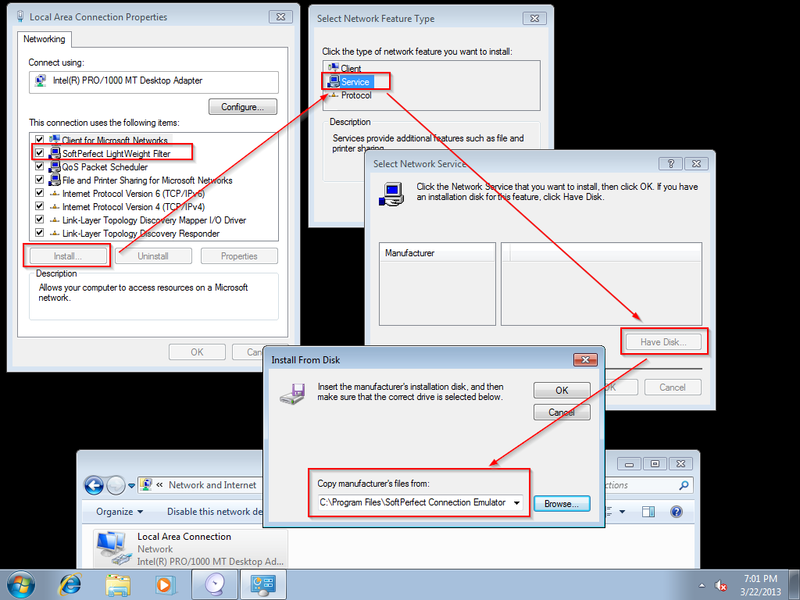 I´m using W7 Enterprise Edition 64Bit and the latest version of Connection Emulator. I´d like to buy a site license when it works fine. I am not sure, but you can try the manual installation. Please check whether "SoftPerfect LightWeight Filter" shows up in the list of items bound to the LAN connection. If not, try to install it manually as shown below. When I start the program I get the error message: "Unable to initialize the network driver. Please reboot the system or re install this application"
I'm running on Win7 enterprise 32 bit. I uninstalled rebooted nothing helps. Have you tried the above advice?